Hi, happy day before Thanksgiving! Got my turkey breast cooking now and the whole house smells wonderful. We are going to our daughters tomorrow for dinner, but making the breast so we can have cold sandwiches over the weekend! Making pies in the morning and sweet potato souffle and a salad to take. It got cold here overnight and they are saying snow for Friday, so beginning to feel more and more like winter. Today's card is made from a beautiful stamp by Inkadinkado. I stamped it on white glossy card stock, then using the sponge applicator by Tim Holtz, added color with dye ink, in blues, pink and yellow. 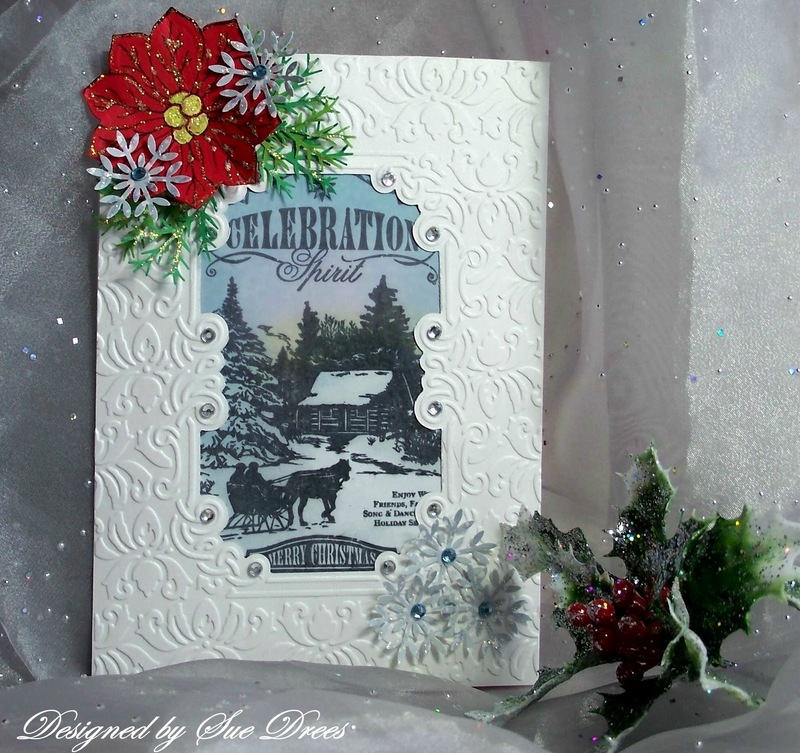 The embossing is a 5x7 emboss and cut plus folder from Cuddlebug. The flower is a stamp by Heartfelt Creations. The snowflakes and the greens are punches. Sue...I LOVE IT! This is so pretty.That embossing plate is so pretty surrounding the gorgeous scene. 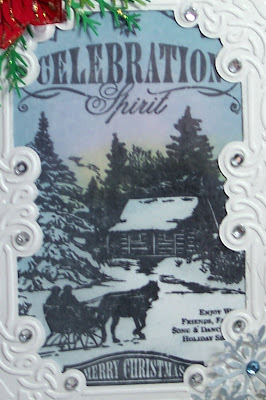 Gorgeous card, Sue - that image is so lovely! Your turkey breast sounds yummy! I'll cook our turkey tomorrow as we won't eat until 4ish... Happy Thanksgiving! Hugs! FUZZY WUZZY NOVEMBER CHALLENGE - PICK A SEASON!